Tis the season for buying goats! Since most goats give birth in spring, and because dam-raised kids can’t be sold until they’re two or three months old, now is the time when new goat owners are bringing home their babies. Here are answers to the most common questions I receive from customers. One of the things I love about raising goats is that I don’t have to buy an expensive trailer to transport them. Goats can easily be transported in dog crates. Two or three young Nigerian dwarf or pygmies can fit into a large crate, while two or three standard-sized kids might need an extra large. You can ask the breeder what size they are, to be sure, especially if they are more than four months old. If you are buying adults, you’d need a large crate for one ND or pygmy and an extra large crate for a standard sized. If you are buying a buck that’s old enough to breed, he should be in his own crate. The crate can sit on the back of a pickup truck, but if it has a topper on it, be aware of how hot it might get in the summer sunshine when all closed up. Goats would be fine back there in winter, but if it gets above 100 degrees, it could be dangerous for them. The crate can also sit in a minivan or SUV, if it’s a plastic crate. You could use a wire crate, but be aware that if a goat squats to pee in a wire crate, they could wind up peeing on the inside of your vehicle. (Do I have to tell you how I know this?) You might want to set the crate on a shower curtain that’s been covered by an old sheet to absorb the urine so it doesn’t run off the shower curtain. It’s also a good idea to put straw or wood shavings in the crate to absorb urine during the trip. If the goats will only be transported for a couple of hours, you don’t need to worry about food and water. If the trip will be three hours or longer, it’s nice to give them some hay to munch on during the trip. If it’s going to be four hours or longer, it’s a good idea to stop after a couple of hours and offer them a drink of water. Don’t leave water in the crate, however, because odds are good that they’d spill it. Hay and hay feeder — If your goats will be spending the night in the barn, they need hay. 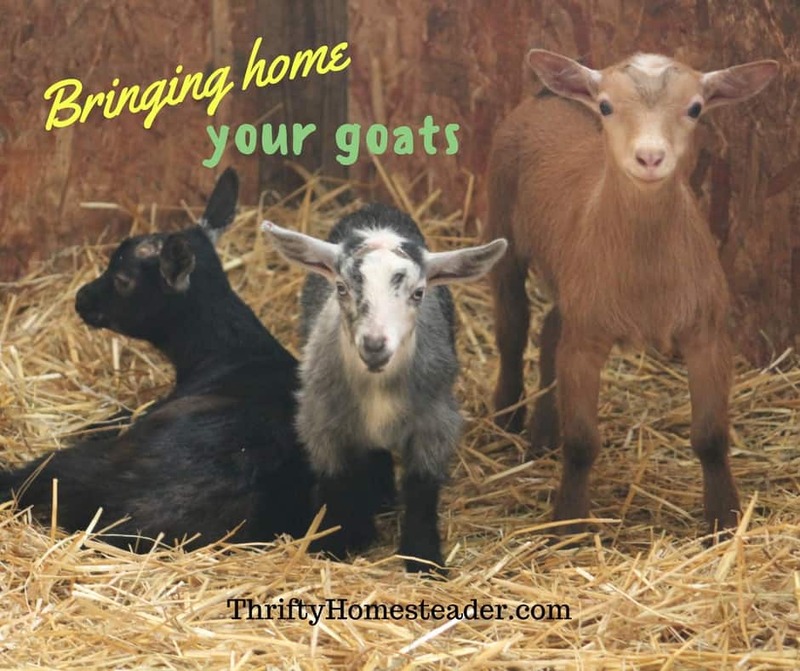 If they’re living in a pasture 24/7, and it has plenty of grass, you may not need much of it, but it’s a good idea to at least know where you can buy hay, if the goats go through the pasture faster than you expect. You don’t want to let them eat the grass down to the dirt. Learn more about rotational grazing with this post. In addition to reducing parasite problems that can be caused by feeding hay on the ground, you will also save a lot of hay by using a hay feeder. Goats are surprisingly picky about eating off the ground. If you put hay on the ground, they will eat far less than if it were in a hay feeder. It’s bad enough that if it is in a hay feeder, they won’t eat hardly any that falls on the ground. Feed pan and grain — If you are buying wethers (castrated males), they really should not have grain. If you want to get some to use as a treat in the beginning, you can do that, but once the first bag is gone, don’t buy another one. Feeding grain to them increases their risk of urinary calculi. Bucks don’t usually need it either, for the same reason. Doe kids may or may not need grain, depending upon a variety of factors. It’s a good idea to ask the breeder if they have been feeding grain so that you don’t make any sudden changes in the diet. At most, they would need 1/4 cup to 1/2 cup twice a day. Does on the milk stand normally eat grain while they’re being milked, and most goat feeds recommend something around 1 pound of grain (feed) for every 3 pounds of milk produced, but check the bag for feeding directions. For more information about feeding pregnant does, click here. 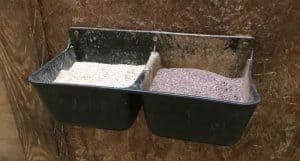 Mineral feeder — Goats need loose goat minerals available free choice, which means you need a mineral feeder. Check out my post on Goat Minerals: Why, What, and How for more information on the importance of minerals and what your goats need. Bedding — Most goat owners use either wood shavings or straw as bedding in their barn. It soaks up urine, and the poop falls to the bottom. Price usually makes the decision for most people. We live in wheat country, so straw is cheapest for us. But if you live in an area that has lumber mills, you might find that shavings are cheaper. If you don’t have bedding, your goats will wind up laying in their own poop and pee, and that’s just gross. Water bucket — Goats need fresh water daily. This is one reason it’s not any additional work to care for three or four goats than it is to care for one. Even if they don’t finish a bucket of water, you need to dump it and give them fresh water once or twice a day. If you see poop in it, it must be changed immediately. Goats won’t drink from a bucket that has poop in it. A two-gallon bucket is fine if you have only a few goats. Once you have five or six goats it’s better to get a second two-gallon bucket than to provide a single five-gallon bucket. It’s that poop thing. If a goat poops in a bucket, it’s always nice to have another bucket available for them, in case it’s still a few hours from chore time. Milk stand — If you are buying a doe in milk, you need a milk stand. Do not even try to milk a goat without a milk stand. Very few does will stand in the middle of a barn and let you milk them. It is not worth trying when you are new to milking and you have a doe that’s a total stranger to you. Click here to learn more about milking a goat. To learn more about goats, check out my Beginner’s Guide to Goats. I’m new to goats and we are bringing home our first one in a few weeks, but his friends won’t be joining him for 2 weeks after he comes home. What can I do to help him adjust? We have dogs, horses and chickens. I would see if you can adjust the pickup dates so that they are the same. He will be very upset and stressed out if he is alone, which can lead to an outbreak of coccidiosis. Most reputable breeders understand that goats need friends and will be happy to make the adjustment in the pickup dates. After all, the kid is less likely to get sick if it goes home with two friends rather than alone.